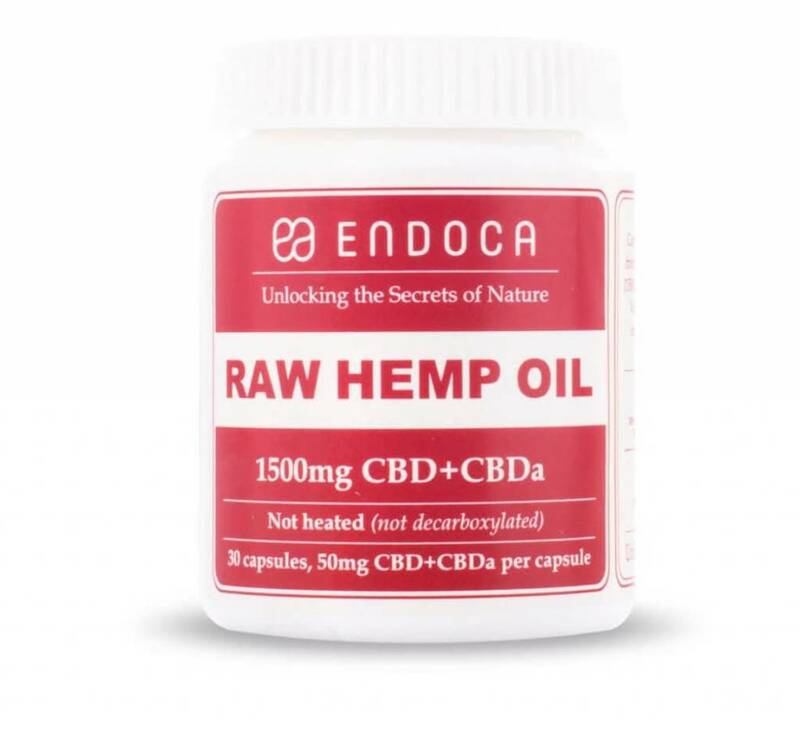 Endoca Raw Hemp Oil Capsules in 3% and 15% formula - The closest thing to juicing hemp, Endoca's raw cbd oil capsules are a convenient way to get your daily serving of raw hemp oil and cbd. 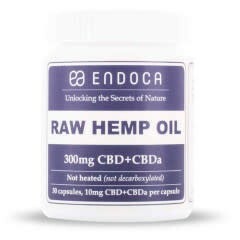 Endoca’s Hemp Oil capsules are vegan which means they are made from pure plant ingredients, no animal by-products, and are also completely kosher. Furthermore, they are free from preservatives, artificial colors, starch, sugar, corn, wheat or dairy. Look inside each capsule and you will find pure CBD oil. Not only that but Endoca refrains from using any heat, just CO2 from air you breathe to produce a pure, whole plant extract full of pure hempy goodness. 1 Capsule contains 10 mg (3%) or 50mg (15%) CBD respectively. Vegan gel caps, Gluten-free, Kosher. Ease of use due to the fact that it is smooth, slippery, odorless, tasteless, easy to swallow. 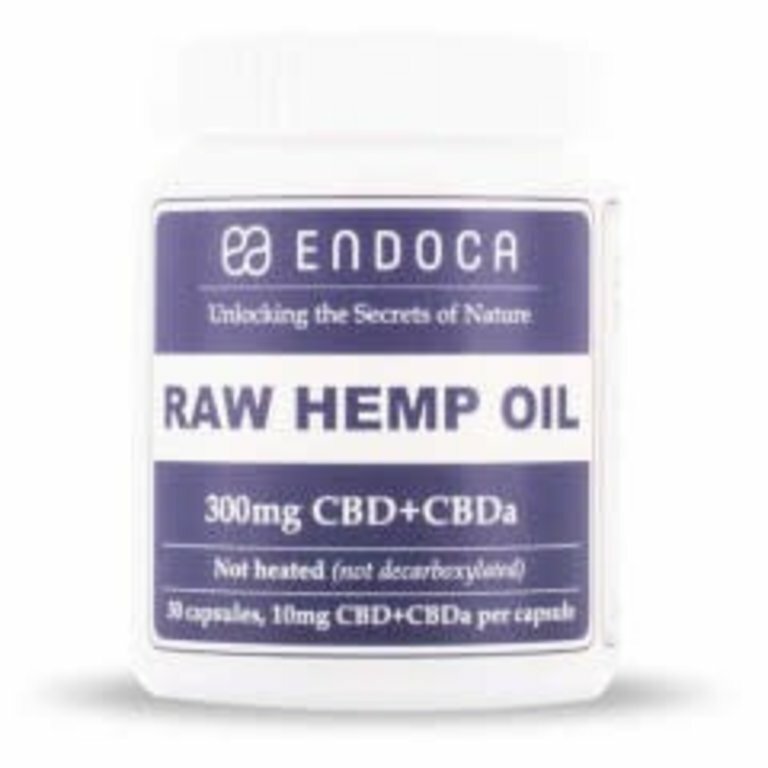 The extracts Endoca produces, are made of Hemp plants that grow in EU without the use of pesticides and herbicides in order to achieve high quality CBD and safe products. These are the basic pillars of good health and without them our well being can be compromised. Active compounds in the hemp plant such as cannabinoids, terpenes, plant waxes and micronutrients work in synergy with our own biochemistry to bring about a sense of holistic health. CBD + CBDa compounds found naturally in the hemp plant, stimulates our endocannabinoid system - our body’s natural balancing mechanism regulating biological functions such as sleep, appetite, mood, pain and our immune system. Sometimes thanks to the stressors of modern life, this internal balance can become compromised. 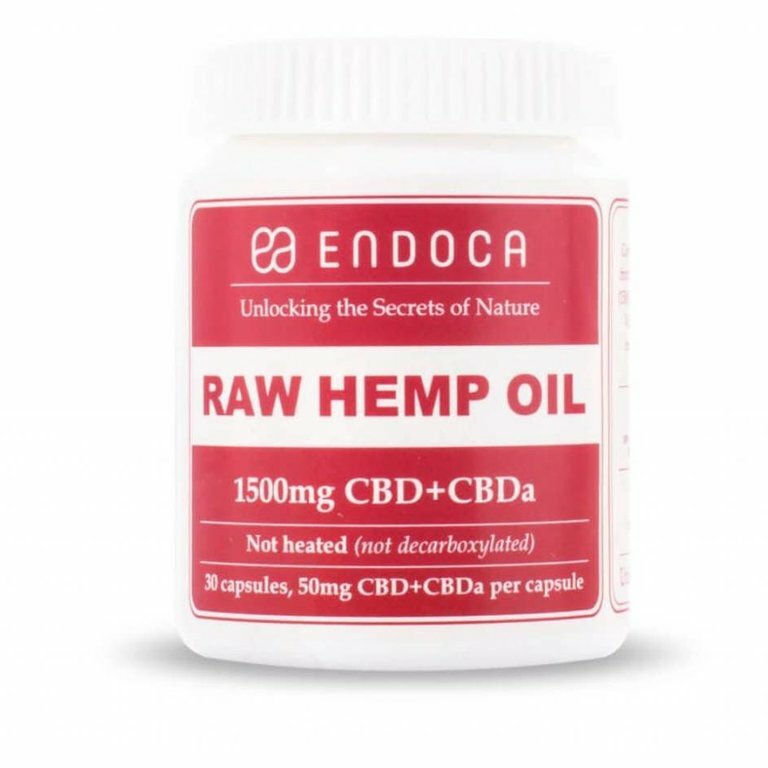 Endoca has discovered an effective natural solution in hemp, which produces phytocannabinoids that are similar to our own. Adding hemp oil to your wellness routine can help to keep those cannabinoid levels in check. If you believe in the unadulterated power of plants, you will also love our 10mg Raw Hemp Oil Capsules. Using unfiltered, unheated hemp, this is the easiest way to enjoy our raw hemp oil range with its unique combination of over 400 molecules, but without the hempy after taste. Endoca's special formula contains vital cannabinoids, vitamins, minerals and plant waxes that are often lost in our diets. You’ll get this and more in one simple capsule. Endoca makes the bottles as small as possible for portability and convenience. Wherever you are, be it on the go, at work or on vacation, Endoca Hemp Oil travels right along with you, even fitting in your pocket. Endoca is constantly striving to ensure that our customers get exactly what they see on the label. To do this we employ rigorous laboratory testing and a strict pharmaceutical standard control that guarantees consistent potency and purity. Our team of experienced scientists, herbalists and nutritionists work hard to produce our organic extracts to the highest standards of good manufacturing practices.Endoca employs a team of experienced scientists, herbalists and nutritionists to produce our organic extracts to the highest standards of good manufacturing practices. Each CBD capsule contains 10mg(3% formula) or 50 mg (15% formula) of CBD(Cannabidiol) + CBDa, from organic certified hemp cultivars free from pesticides, herbicides and chemical fertilizers. The oil also includes the plant waxes, as well as co-factors and co-nutrients.